On May 7, 1862, Gen. Simon Cameron, his wife Margaret, their son Simon, and daughter Maggie departed for Liverpool, England, on the Persia. They were on their way to St. Petersburg, where Cameron, recently removed by President Abraham Lincoln from his position as Secretary of War, was to serve as the U.S. Minister to Russia. They spent time in a half-dozen European capitals, including Paris, where they admired furnishings for the century-old house of Harrisburg founder John Harris, Jr., which they planned to purchase. Among the treasures they selected were mirrors and mantles, china, stained glass, and a spectacular scenic wallpaper from the famous Zuber & Cie, founded in 1797 in Rixheim, France. 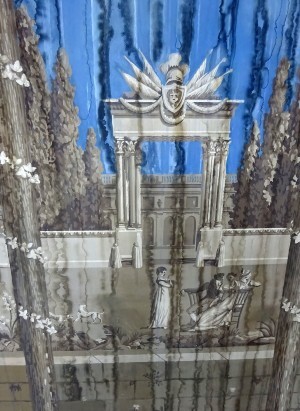 The Zuber factory still prints wallpapers, fabric, and leather using the traditional woodblock-printing technique. This makes it the last factory in the world to use this 18th century technique for its production. You can see how this work is done in this video. The factory has kept documents in its archive since the beginning (more than 130,000 documents) as well as all the manufacturing tools (150,000 woodblocks, carved by its workers between 1797 and 1870). The main strength of these archives is their scale, especially during the first half of the 19th century. The paper was destined for installation in what would be Gen. Cameron’s favorite space, a light-filled solarium to be added onto the venerable old mansion. The “Versailles” pattern was chosen, perhaps for its vibrant blue skies and vignettes of 18th century life in the French court. 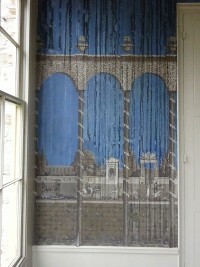 After more than 150 years, the Zuber wallpapers are in a seriously degraded state of repair. Sunlight, water, heat, cold, and human activity have all taken their toll, resulting in stains, tears, cracks, and smudges. But all is not lost. It is possible to clean the papers, repair the walls, re-adhere loose portions, reattach any paint flakes, and reduce water stains by blotting or disguising them with pastels. 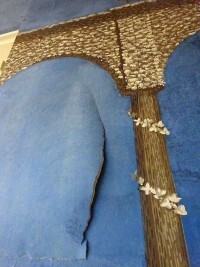 When completed, an acrylic barrier will safeguard the wallpapers from touch and abrasion. Special glass panels will be mounted inside the windows in and near the solarium to protect the Zuber wallpapers from the sun’s damaging rays and to add an insulation factor. As you can imagine, this will be an expensive project, with costs nearing $40,000. Will you pledge to help us restore this rare treasure for future generations? Who will do the restoration? 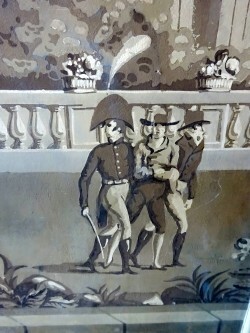 In wallpaper conservation, preservation of the original material and reversibility of the treatment are the foremost concerns. 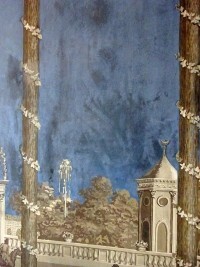 Selected to do the painstaking work of restoring the mansion’s Zuber wallpapers is the firm of Historic Wallpaper Specialties of Johnson City, Tenn. Their team has served the White House, George Washington’s Mount Vernon, James Madison’s Montpelier, the Frederick Douglass House, James Buchanan’s Wheatland, and more. Will you help us to preserve this treasure for future generations? Here are some suggested levels of sponsorship. You may make a donation of any size, large or small. Every gift is invaluable to us and is tax-deductible. Does your employer offer a matching donation program? Please inquire as to whether your gift might be matched. If you friends or are the member of a group or organization that would like to join you in this effort, please direct them to this website. How can you donate? Decide how much you want to give to save the treasured Zuber wallpapers, then call our office at (717) 233-3462 or write to director@dauphincountyhistory.org to make your pledge. If you choose, we can set up a plan to receive your pledge in several payments. 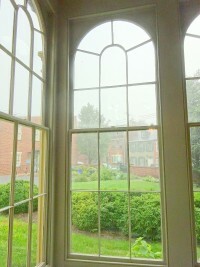 Thank you so much for working with us to preserve and beautify the Camerons’ solarium! Did you know? There are approximately 90,000 structures and sites on the National Register of Historic Places. There are 2,500 of them around the country listed as National Historic Landmarks. In Pennsylvania there are only 169, and only three of them are in Dauphin County, all in Harrisburg. Of course one of them is the Harris-Cameron Mansion. 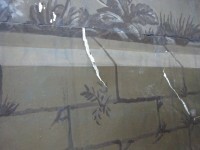 Here are additional examples of both damaged and undamaged sections of the Zuber wallpapers. These elegant windows bring light into the solarium (or garden room) where Simon Cameron enjoyed breakfast while surveying his wife’s rose garden. 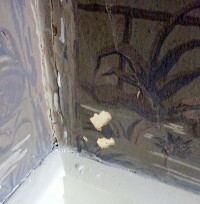 A water leak from many years ago caused this damage. 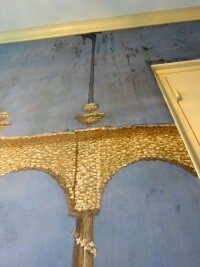 The roof has now been repaired and the wallpaper panel awaits restoration. 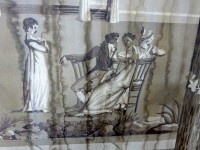 Both water damage and abrasion are seen in this section of the Versailles scene. This group of young aristocrats hanging around the French palace seem to be unaware of the water damage all around them. This particularly beautiful section has suffered from touching over the decades. Here we see a section of paper which has torn and where the glue behind it has dried out. This repair can be made so that the tear will be virtually invisible. Small pieces of the paper have torn and have disappeared. This area can be in-painted and the entire area cleaned and re-attached. Tears are evident in this photo. Repairs will make the paper look almost new again. 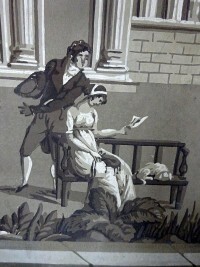 In an relatively well-preserved section of the Zuber wallpapers, this young couple enjoys a sunny afternoon at Versailles, outside of Paris, France. Uh-oh. Someone has been bad and is being led off by the authorities. Not everyone is having a good time in our solarium! 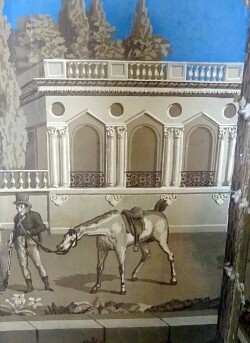 A man leads his horse in front of an elegant section of the Palais de Versailles. 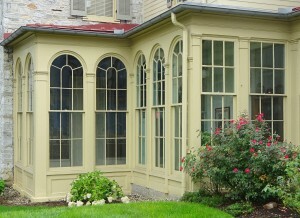 Here is the solarium seen from the rose garden. As you can see, there are many windows which need to be covered with special glass to block damaging ultraviolet sunlight. The John Harris-Simon Cameron Mansion, administered since 1941 by the Historical Society of Dauphin County, is a National Historic Landmark interpreting the period of occupancy from 1766 to 1933. Its most notable 19th century resident was Gen. Simon Cameron, entrepreneur and politician, who lived here when in Harrisburg from 1863 to 1889. 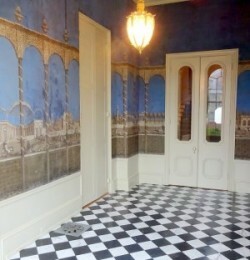 He altered the house of John Harris, Jr., to the then-popular Victorian style and furnished it accordingly, including the Zuber wallpaper. His family and their descendants lived here until 1933.